I know, it’s Monday, not Sunday. 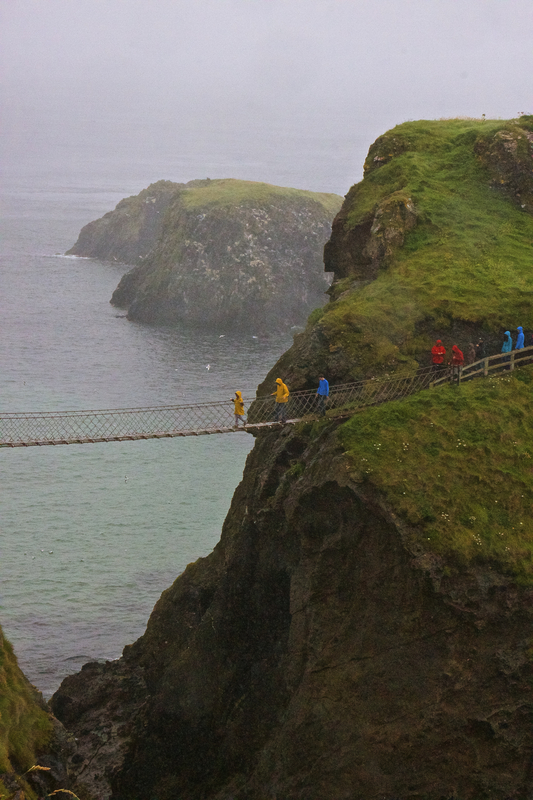 And, that photo up there is not food, nor farm, but of our recent expedition to the rope bridge on the Northern Coast of Ireland in the blowing wind and rain. See those little people in yellow slickers? (Black Dog Martha’s Vineyard, the best!) they are Richard and Geoffrey making their valiant crossing…..yes, you can cue a little Wes Anderson film theme music now ♩ ♪ ♫ ♬ ♭ ♮ ♯. I really wanted to try and do these posts every Sunday, and apologies, I’m finding it’s just is not working out that way. We’ve been chockablock busy here (like everyone else, right?). Fine tuning things on the farm and staycationing because we couldn’t travel to the USA this summer due to farm demands (massive sob session, followed by a good ‘ole Irish “get on with it”). We are also now in the process of fine tuning my book; I will be getting full proofs from ROOST in the next two weeks, it’s really all happening people! (For those that are not following along on other various social media platforms where I am VERY chatty, my publishing date was pushed back to March 17th, 2016. Yes, that is St. Patrick’s Day, and 2016 also commemorates the 100th anniversary of the 1916 Rising, so will be quite a remarkable time for my book to be released) The date got pushed because of a Random House (who prints/distributes) new timeline policy with illustrated cookbooks. I have seen a few pages of the interior design and I have to say I am really proud and blown away by the creative direction. The designer also just worked on the new Vermont Country Store Cookbook (squeal!) amongst others, have a look at her work if you’re interested. Okay, sidetracked! These posts are supposed to be less about my life and more about others, so without further adieu, here are some things that have tickled my fancy over the last couple of weeks…..
Freckle. So, we staycationed on the North Coast of Ireland (my husband’s family ancestral home is Dunluce Castle in Bushmills, crazy!) last week, and I hope to contribute a magazine piece about our AMAZING experience, but until then you’ll see a few bits here. I stumbled upon Freckle magazine while having an incredible meal at Harry’s Beach Shack in Portstewart, County Derry. Freckle is one of those totally warm and fuzzy beautifully curated thick paper matte mags, and this one focuses on visual stories of kindred people and the rugged landscapes of Northern Ireland. Worth seeking out. The Irish brown bread at Mustard Seed in Ballingarry, County Limerick. HOLY. The Mustard Seed is a restaurant and inn housed in a former convent, so it’s only fitting that this creation is absolutely heavenly. I popped in for tea and left with a fresh-out-of-the oven loaf of their signature brown bread thanks to the ever-charming maître d’, John Edward. The sweet, nutty fragrance took over the jeep* on the way home and I am not ashamed to admit that I had to break off a piece halfway through the journey to nibble on because I couldn’t make it home without doing so! If you haven’t dined or stayed at the Mustard Seed, it is truly a MUST when visiting the southwest of Ireland. Cheerz Polaroids. 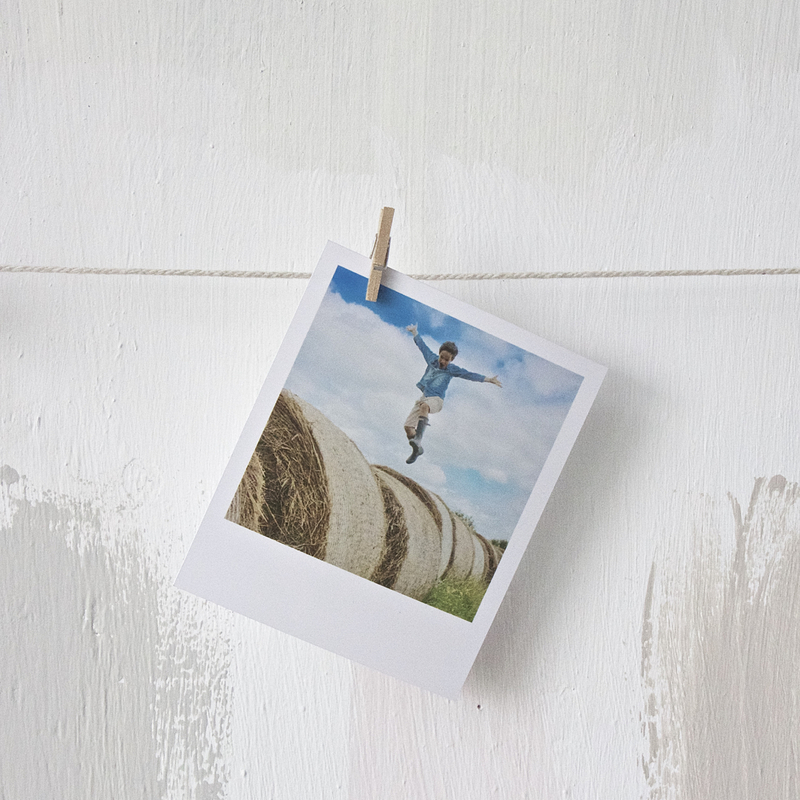 Pick and choose your favourite Instagram images to be printed vintage Polaroid style, in glossy or matte. I had so much fun with this! Leave a comment to be in the draw for a collection of your own, I will choose 2-3 winners who will each receive a voucher for free prints. Pudding Row, Sligo. Darling Dervla James, co-founder of the hugely successful Pepper Pot Café in Dublin, has returned to her hometown, the picturesque Easkey Village, to set up Pudding Row Café along with her husband Johny Conlon and daughter Edith in tow. I can’t wait to visit. This Char-grilled salad is the epitome of summer to me, thanks Phyllis! Pasta with Benefits? This new Irish plant-based pasta brand sent me a sample and it was actually really quite good. Gluten-free pastas usually aren’t too great, but do give this one a go if you’re Ireland based. 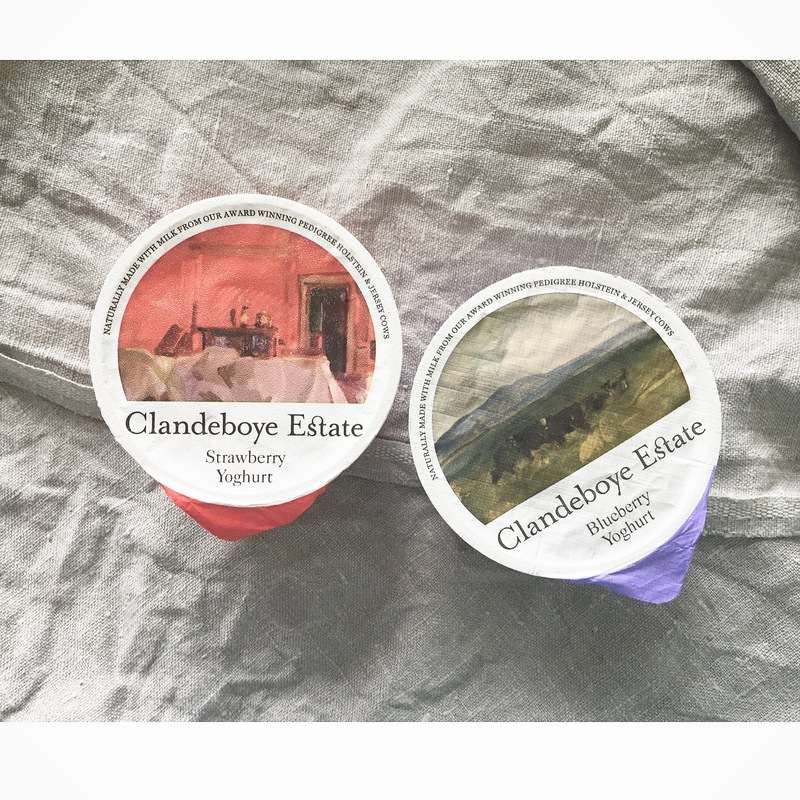 Clandeboye Estate Yoghurt. For the packaging alone, but the fresh ingredients and utter creaminess of this Northern Irish yoghurt sure measures up to that gorgeous artwork on the seal. Our lovely friends, the Gastronomic Duo, are back in action after a move from Seattle to the wilds of Bozman, Montana. They’ll even come cook for you, here’s an example menu (WHOA). Best of success Lori and Justin, we hope to visit one day! 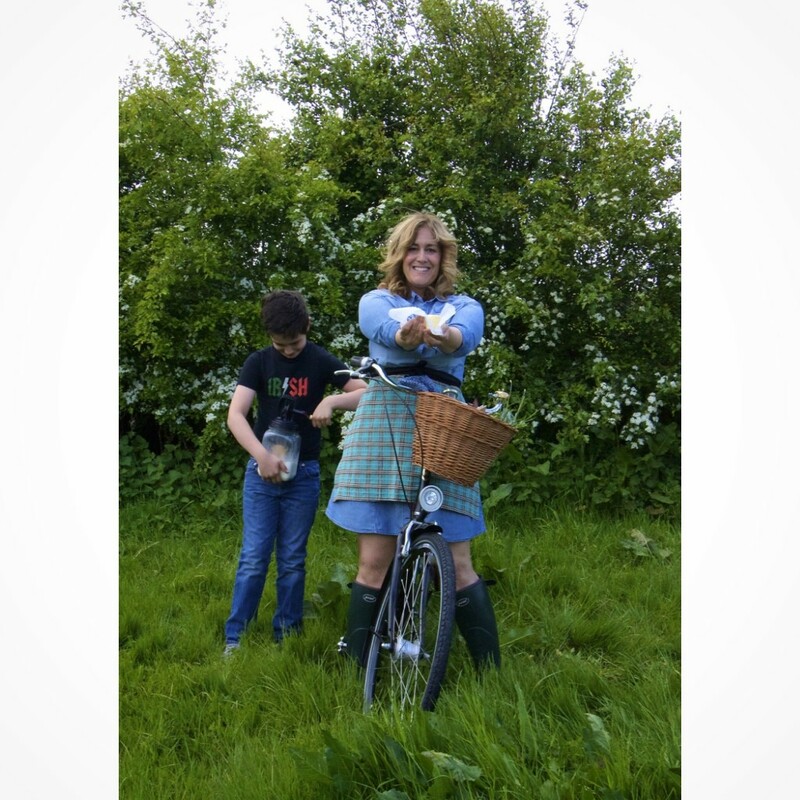 Just a little reminder that myself and the little farmer will be doing our butter thang at this years’ Electric Picnic so please come along if you can get there! We are delighted to be using gorgeous Glenisk organic cream for the demonstration and you will get a voucher to go home and do a little DIY too. If butter is not your thing, then check out all of the other incredible food “acts” at John and Sally McKenna’s brilliantly tasty brainchild, the Theatre of Food. Naomi from Farm to Table Feasts featured my Lens & Larder partner, Cliodhna Prendergast on her blog recently, super lovely interview. 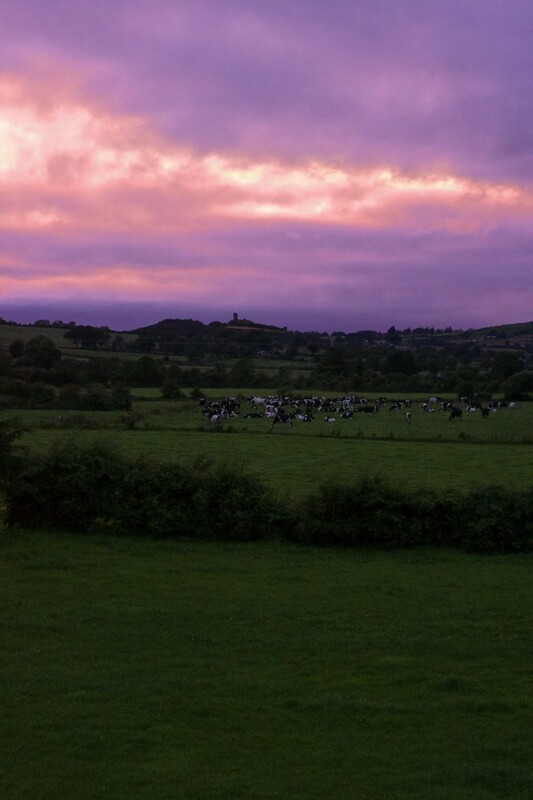 Here’s the welcoming purple pink bovine Shanid castle sunset that we came home to on our return from the North….always good to be home. Moooooo.